Journals have always played a main role of vitalizing research and scholarship in academic institutions. At the OML Center, we produce the CDD Journal as channel to collect and communicate new information, methodologies, and findings towards building a body of knowledge for climate change discourse and action. In its recently published issue, the CDDJ features five articles that assessed the impacts of climate change in different socio-ecological systems. Based on a modeling study conducted in Leyte Gulf, Philippines, one article assessed the status of the typhoon-affected reefs in 12 municipalities. Findings show that the reef ecosystems are in a degraded state and will further experience a reduction in live coral cover due to typhoons. This can reduce the biomass of many functional groups and thereby affect the fisheries production and livelihood in Leyte Gulf (Read more). Another modeling study evaluated the impacts of climate change on the water resources of Tacloban, Philippines – the city most devastated by typhoon Haiyan in 2013. The authors warned that Tacloban will likely face water scarcity, as current water resources may fail in providing sufficient water to the region for future scenarios (Read more). Typhoon Haiyan also severely damaged the transport system of Tacloban and one article in this CDDJ issue analysed the transport dimension of disaster governance in the post-disaster recovery phase. The results suggest that remobilization efforts can still be vastly improved to address mobility and accessibility needs of people and communities immediately after an extreme event towards achieving a more resilient transport system (Read more). Two papers assessed the impacts of Typhoon Bopha in Eastern Mindanao. Typhoon Bopha was the most powerful storm to have hit the island of Mindanao, southern Philippines in more than 100 years of recorded storms. One study on adaptation gaps found that the lack of participatory governance resulted to some mismatches between the recommended adaptation actions and the forms of adaptation assistance that the affected communities preferred (Read more). The other paper investigated the adaptive capacity communities to flash floods and landslide. The findings revealed that a higher number of indigenous people (IP) have low and very low adaptive capacity than non-IP due to (lack of) access to resources including education and calamity support as well as skilled and contract-basis types of employment (Read more). Visit the CDD Journal website for other research articles on climate, disasters, and development. 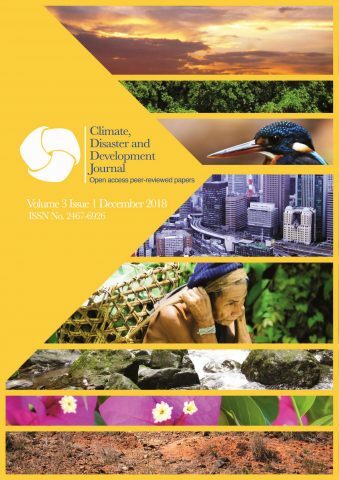 CDDJ is an open-access platform for peer-reviewed papers on all aspects and intersections of climate, disasters, and development, and their interaction. Here’s a brief guide if you are interested to publish your paper in CDDJ and please refer to the call for submission flyer and submission guidelines for more information.